If you’ve run The Boilermaker, or if you’ve ever been involved in any capacity, you’ll know what I am talking about. If you’re getting ready for your first time participating as a runner, spectator or volunteer, you are in for something really special. And if you haven’t experienced it yet, here’s a little taste of what you’re missing — my humble, tongue-in-cheek tribute to my favorite race. 15. The spectators who hold up signs saying “Only nine miles to free beer” just after the start. You mean this isn’t the beer line? That’s not funny, man. Not funny at all. 14. The International Mile. 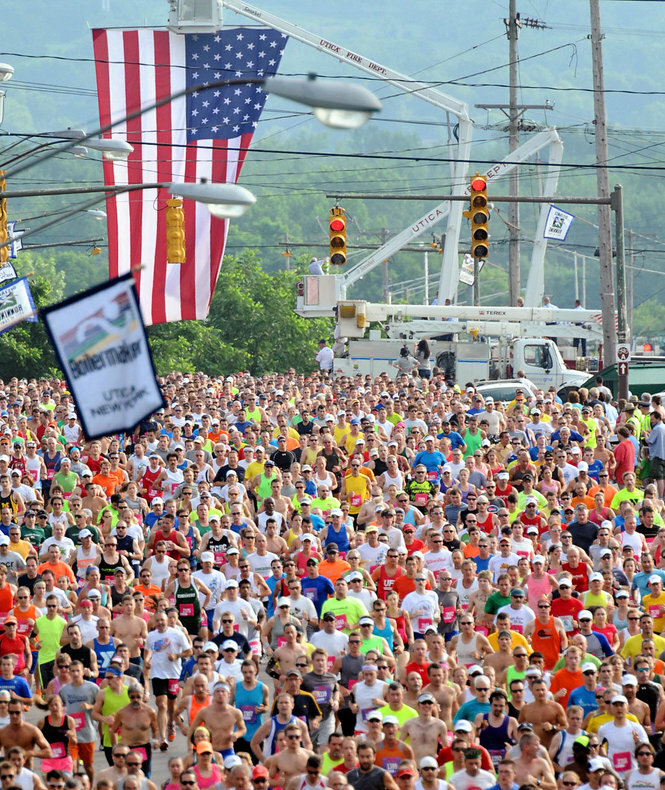 Because the combined energy and awesomeness of 13,000 runners running up Culver Avenue isn’t nearly enough. 13. The cool, shaded section of the course around mile two on the Parkway. It’s going to be like this all the way round, right? 12. The Golf Course Hill. Because it makes you feel like a badass when you get to the top and a Kenyan when you get to the bottom. 11. The aid station at the top of the Golf Course Hill. [Internal monologue] “Clean handoff on the water cup … dammit … clean handoff on the water cup … dammit … clean handoff on the water cup … dammit …” (a true story from my 2015 run). Don’t laugh. It will happen to you. Maybe not at mile four. Maybe not at the Boilermaker. Maybe not this year. But it will happen. Oh yes, it will happen. 10. The animal out in front of the Utica Zoo. Because it’s good to be reminded that you are faster than an iguana. Over nine miles. 9. The families who set up sprinklers and hand out ice pops on the Parkway around mile five. You. Freakin’. ROCK. 8. Burrstone Road. Proving that Noel Coward was only partly right when he sang about mad dogs and Englishmen going out in the midday sun. He forgot to include runners. 7. Rounding the corner onto Champlin Avenue. The crowd is three or four deep and cheering like crazy. The hard part is behind me. I feel like an Olympian. Maybe I won’t die after all. 6. The Stilt Guy midway down the Champlin Avenue hill. Dude, I’m eight miles in and you want me to jump for a high five? Really? 5. The band midway down the Champlin Avenue hill. Because I, too, turned it up to eleven in my parent’s garage before I became a middle-aged runner. Rock on, gentlemen. Rock on. 4. The Mohawk Valley Frasers Bagpipes. It’s mile nine, I’m English, I’m half dead and you’re playing the bagpipes. Rub it in, why dontcha. 3. 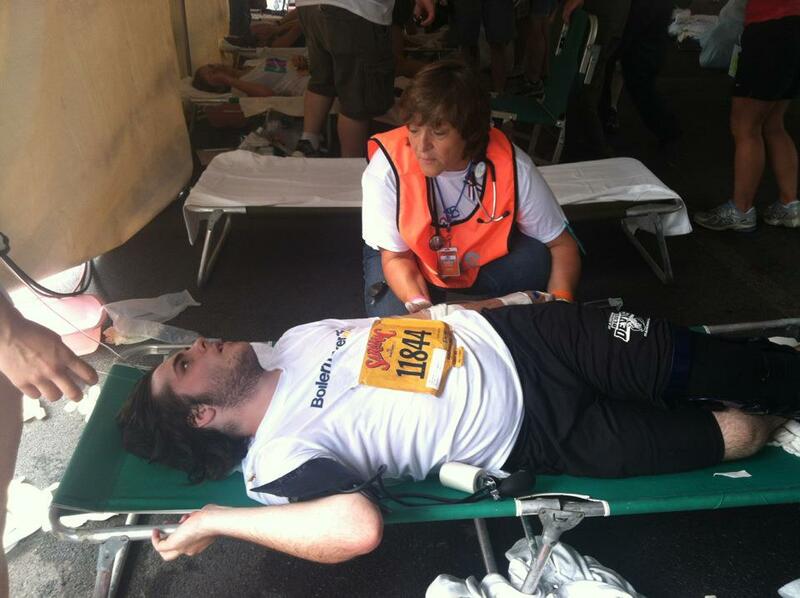 The first aid tent at the finish line. Because dehydration. 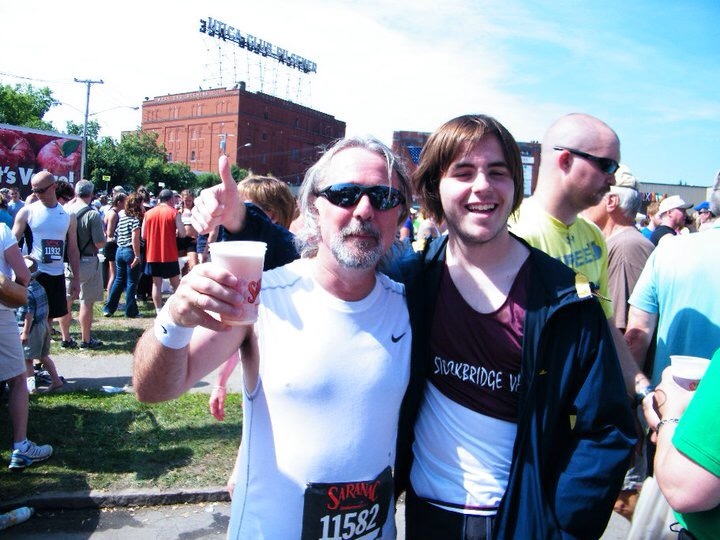 Just ask my son (a true story from my 2012 run). 2. The organizers, volunteers, first responders, local government and people of Utica. For throwing an amazing party and allowing a race to break out. 1. Free beer. Oh, like you didn’t see that coming. Celebrating a PR and finishing my sixth Boilermaker. July 12, 2015. As I have done every year for the previous six years, I’ll be enjoying mine right outside the Polish Community Center. Stop over and say hello. 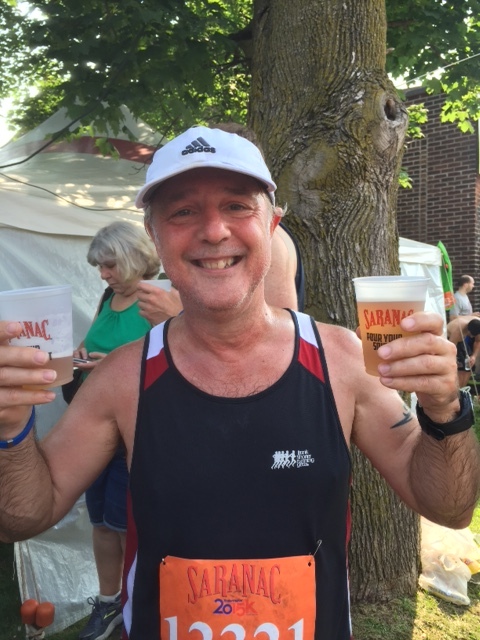 UPDATE: A revised version of this post appeared in the 2018 Boilermaker Race Program. You can view a pdf version of the piece here. 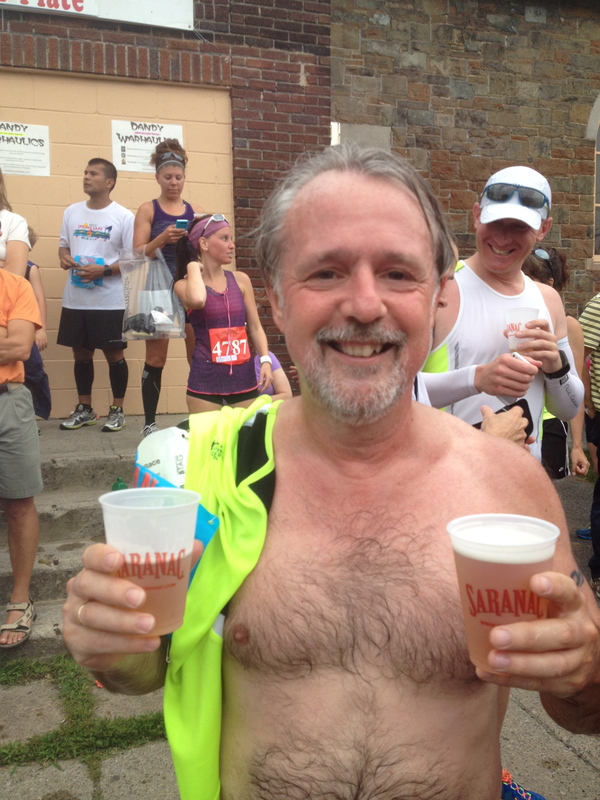 This entry was posted in The Flat-Footed Fox and tagged 15K, Boilermaker, long-distance running, NY, Utica. Bookmark the permalink. Cool! How did she do? And, more important, did she enjoy herself? She ran 7/13/14. bib 3401 rochester ny. I dont know how to read results. 1:17:02. Not too shabby! Definitely faster than me today, but then I am–ahem–just a little older LOL! Thanks for the inspiration, Sandy! Have a great race on Sunday! You can and you will!